Nightlife in Lisbon is as sparkling and as diverse at it gets. Thus, the capital of Portugal manages to cater for the nocturnal leisure needs of all, regardless of tastes and pockets. Disco hopping is just as rewarding as attending to a cultural event, with opportunities ranging from glitzy venues and pretentious outfits to relaxed and down to earth alternatives. So, either a spendthrift or a budget traveler, mainstream or part of the gay community, the visitor of Lisbon will always find something to do in order to sample the best of what the capital of Portugal offers in terms of nighttime pursuits. A unique feature of Lisbon by night is represented by the fado houses where tourists can listen to the traditional Portuguese songs. However, connoisseurs incline to believe tourists who want to listen to the authentic fado music should not head for the tourist-oriented venues, but instead they should ask the locals who know the whereabouts of these venues. The same holds true with respect to the celebrated coffeehouses. Regardless of tastes and priorities, the Bairro Alto and the Alfama districts concentrate the highest density of nightlife venues, but again, as a rule, in order to get in touch with the authentic beat of the city, tourists should take a moment and observe the locals’ preferences, given this is the best indicator for a genuine Portuguese experience. Centro Cultural Belem is one of the most complex venues of Lisbon where a wide range of events are organized, ranging from exhibitions to music performances and theater representations. The center also accommodates a tourist information office. Visitors can attend the performances organized by the Foundation’s choir and orchestra, but in order to asses the foundation’s impact on the cultural scene of Lisbon, they must also keep in mind this institution also initiates sundry musicological studies and grants all sorts of scholarships. The Villaret Theater was founded in 1964 by Raul Solnado. Ever since, its reputation on the cultural scene of Lisbon has increased dramatically. It bears the name of Joao Villaret, a major Portuguese screenwriter and actor in the mid 20th century. 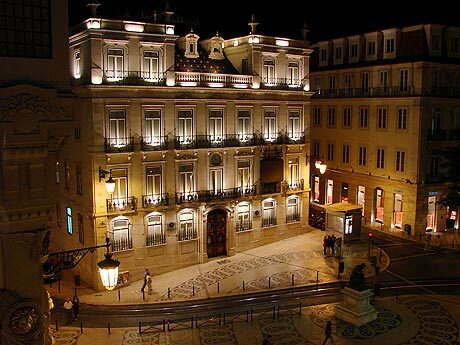 The Trindade Theater is located in a beautiful old 19th century building of Lisbon. It is one of the most prestigious theaters in the city, and its reputation matches the admiration locals have for the theater hall proper: architecturally speaking, the building stands out by its lush outside and inside decorations (the ceiling, the auditorium, and the massive central chandelier). 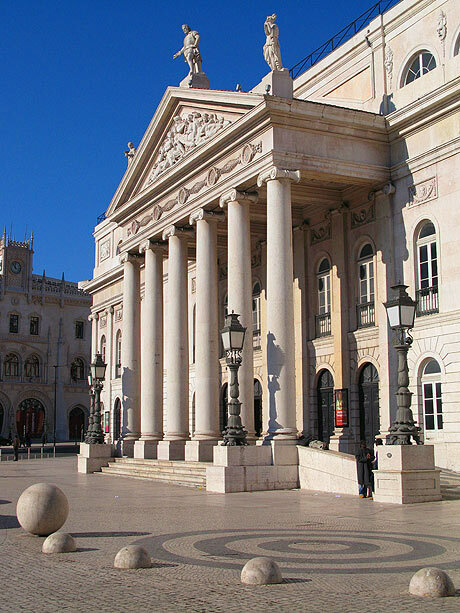 The building which is home to the Sao Carlos National Theater is one of the most notable architectural landmarks of Lisbon. In fact, the structure is deemed one of the several remaining buildings designed and erected in a Classical style in the late 18th century. It bears a striking resemblance to La Scala in Milan and to the opera house in Naples. The theater is home to the most celebrated and appreciated opera productions and classical music concerts in Lisbon. The Dona Maria II National Theater as it stands out today is the work of an Italian architect, Fortunato Lodi, and it dates back to the mid 19th century (1842). It features obvious Neoclassical characteristics, with a pediment overtopped by a statue which renders Gil Vicente, a major Portuguese playwright (deemed founder of the Portuguese theater). The building underwent major restoration works in 1964, when it was also fitted with state-of-the-art facilities. As a historical curiosity, the site filled at present by the Dona Maria II National Theater used to be the place where the mid 15th century Estaus Palace, headquarters of the Portuguese Inquisition, was constructed. The Camoes Theater is the headquarters of the so-called Companhia Nacional de Bailado (National Ballet Company), after a period when it accommodated the activities carried out by the Symphony Orchestra of Lisbon. It was inaugurated in 1998. The Aberto Theater is located in the vicinity of Praca de Espanha, close to the Calouste Gulbenkian Foundation. While it is one of the youngest theaters in Lisbon, it is nonetheless one of the most dynamic of all, a feature reflected by the amount of artistic representations staged each season and by the success of its productions. Coliseu dos Recreios, also referred to as Coliseu de Lisboa, was built in 1890 in the context of a notable scarcity of concert halls in Lisbon. This concert hall accommodates all sorts of representations in the field of the performing arts, including circus shows, ballet and dance performances, as well as theater representations. Located in the Bairro Alto district of Lisbon, the Cornucopia Theater is, it too, a rather recent acquisition for the cultural scene of the capital of Portugal. It opened its gates no sooner than 1973, but it managed to build a solid reputation amongst the theater aficionados of Lisbon. The Maria Matos Theater bears the name of Maria de Conceicao de Matos Ferreira da Silva. It was inaugurated in 1969, but it became the property of the city of Lisbon no sooner than 1982. Located just nearby the Santa Apolonia Train Station, Lux Fragil is very popular with the public up-to-date with the latest musical trends. The unusual yet alluring atmosphere is yielded by the fact the club is located in a 2-floor warehouse. The ground floor is where the frantic dancing takes place, whereas the upper floor is fitted with sofas and eccentric decorations. Lux Fragil is one of the most fashionable clubs in the whole of Portugal and, given its reputation (the bar is said to be often frequented by Hollywood stars and international music and film scene bigwigs), long queues form regularly on weekends, when everyone (tourists and locals alike) tries to get in. Belem Bar Café is one of the glitziest nightlife venues in Lisbon. It is both a restaurant and a club, but one needs a rather deep pocket in order to manage to actually enjoy the evening and the regular theme events organized here. Café Luso maintains the reputation of being one of the few venues where clients can delight in listening to the authentic fado music, despite the fact it has recently borrowed bit of a tourist-oriented vibe. It is located in the Bairro Alto district, and it also puts forward a mouthwatering Portuguese menu. In order to listen to the truly authentic fado music, tourists should definitely head for Senhor Vinho, a venue said not to have yielded anything to the tourist pressure. The venue is also a restaurant, with a menu featuring a tempting array of fish and seafood dishes, a selection of vegetarian delights, as well as hearty specialties for meat lovers. Finalmente Club is highly popular with the local gay men community. It consists of a bar area, a dance floor and a stage where drag queens often put up shows to the public’s delight. The opening hours depend on the amount of clients and on how the night events work out. Bar 106 is yet another bar where gay men gather around in order to spend their nights while delighting in the theme parties thrown here regularly. It is located in the vicinity of Finalmente Club, and that offers clients the opportunity to actually go bar hopping in virtually no time and sample as much as possible from the local gay scene. While Fragil is one of the most prestigious gay clubs in Lisbon, it is often frequented by a consistent heterosexual clientele. The reason is the club lays a special emphasis on promoting a certain type of music, from the leading edge and anti-mainstream extremity of the spectrum. It is popular with both the gays and the lesbians.